Starting off Down Under, the Australian government released a request for tender  (RFT) for 12 new offshore patrol vessels (OPVs) last week. In a statement released by Minister for Defence Industry Christopher Pyne, local industry considerations will play a key part  of the tender selection process. The RFT requires ‘each tenderer to develop an Australian Industry Capability Plan that maximises the opportunities for Australian industry participation.’ The three shortlisted designers  for the new vessels are Damen from the Netherlands and two German firms, Lurssen and Fassmer. The OPVs will replace the Royal Australian Navy’s fleet of 13 Armidale-class patrol craft, at an estimated cost of around $3 billion. The US Navy’s controversial Littoral Combat Ship (LCS) program came under heavy scrutiny  during a testy Senate Armed Services Committee hearing  last Thursday. The hearing—in which one of the participants stated that the LCS program ‘broke the Navy ’—was part of the release of a damning Government Accountability Office (GAO) report  on the failures of the LCS program. The GAO report questioned the Navy’s decision to move ahead on purchasing the program’s final 12 ships, citing poor performance and continued uncertainty about the future vessels’ cost and capabilities. It looks like the F-35 might have to prove its worth in the close-air support (CAS) role in a fly-off  against the A-10 Warthog. In the defence policy bill for 2017, the US Congress proposed that the Pentagon’s chief weapons tester conduct tests to examine the capability of each aircraft to perform CAS of ground forces, combat search and rescue and airborne forward air control. The test may determine when (or if) the Air Force can retire the Warthog. There have been concerns about the Warthog’s retirement, especially in light of the continued reliance on the aircraft in current operations  against Islamic State in the Middle East. The A-10 doesn’t seem to be going down without a fight. German gun manufacturer Heckler & Koch is proving that corporate responsibility has currency in the arms industry. Citing a senior employee, the DPA news agency reported on Monday  that the company would confine its future clientele to ‘solid countries’, described as ‘unequivocally democratic, definitely not corrupt, and in NATO or close to NATO’. Former H&K clients include Middle East dictatorships and terrorist organisations. Several former managers will face trial next year for illegal arms sales to Mexico  that violate German law against supplying arms to conflict zones. The announcement should be welcome news for the German government; it has copped significant flak over the failure to curb a hike in arms exports despite a two year policy of imposing strict arms regulation. The US Defense Departments’ Combating Terrorism Technical Support Office has released its Christmas wishlist through the draft annual Broad Agency Announcement. Details of the listed gadgets can be found here , and include mini data transmitters, sensor suits to study human motion and a fake Facebook. The US Army is facing a battle with Las Vegas’ new hockey franchise the ‘Golden Knights’ . 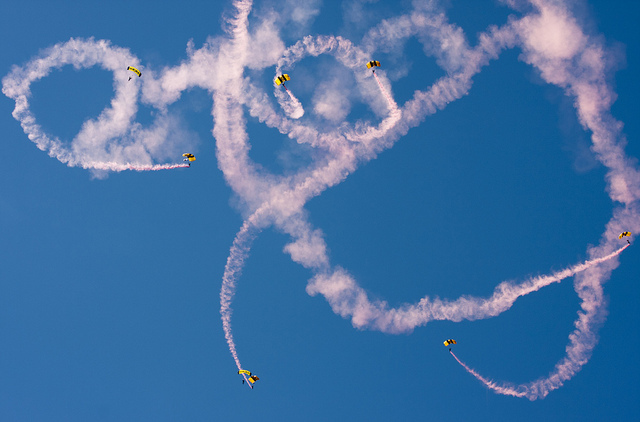 The Army’s own ‘Golden Knights’—the Parachute Team—have held the name since 1960, and they’re not keen to share. Eating your vegetables is important—even in space. NASA has been working on new harvest techniques  on the International Space Station to increase the yield of plants. This will allow for more experiments about how different plants survive in microgravity and offer more fresh food for astronauts. The current ‘Veggie’ plant project will be replaced  in 2017 by the Advanced Plant Habitat, which is currently undergoing final testing at the Kennedy Space Center. Some analysts think  that growing plants in space will also have a therapeutic psychological impact as well as nutrition benefits for astronauts. That could be important for astronauts exploring deep space, as cramped confines and long travel times could take a toll on their mental health. The US Air Force will launch  a new upgraded wideband communications satellite tomorrow. The US$425 million dollar WGS-8 satellite  will be able to carry 45% more traffic and utilise both Ka and X-band super high frequency communications. Part of a series of 10 satellites, one of which has been funded by Australia , the WGS satellite programme will finish in 2018  with the Pentagon seeking new commercial alternatives to deal with their ever expanding need for secure communications. Christopher Cowan, Thulasi Wigneswaran, Elisabeth Buchan, and Alexander Vipond are research interns at ASPI. Image courtesy of Flickr user Nathan Rupert.